1. Naomi Watts, the lead actress in David Lynch’s Mulholland Drive is the daughter of Peter Watts who provided the laughter you can hear in the track Brain Damage on Dark Side Of The Moon (He was Pink Floyd’s road manager). 2. The UFO, the psychedelic club where Pink Floyd were the house band in 1966 and 1967 took place in an Irish dancehall on Tottenham Court Road. 3. John Peel described Floyd's 1969 LP Ummagumma as having "incredibly melancholy sounds, which cross one another, sounding like crowds of dying galaxies lost in sheer corridors of time and space". Pink Floyd themselves thought it was rubbish. 4. Amongst the people recorded for the spoken word parts on Dark Side Of The Moon was Paul McCartney. His contribution was cut. 5. Before they were Pink Floyd the band had lots of names. One of these was The Meggadeaths. 6. Pink Floyd co-funded Monty Python and the Holy Grail. 7. The LP ‘The Division Bell’ was named by Douglas Adams - the author of Hitchhiker’s Guide to the Galaxy author. 8. 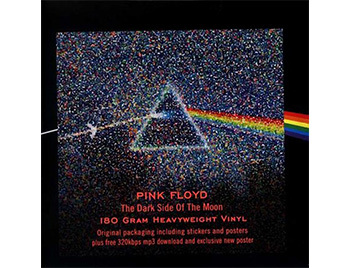 It is estimated that 1 person in every 12 on the planet owns a copy of Dark Side of the Moon. 10. Roger Waters is a big Arsenal fan.